When you need the best kids soccer equipment at the lowest prices on the web, come to soccerloco, your premier destination for all things soccer. We’ve got a great selection of kids soccer gear to make sure you can find just what you need. The youth soccer equipment we carry is only the highest quality equipment for coaches and players alike, so everybody can enjoy the game to its fullest. 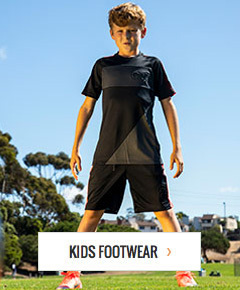 Shop soccerloco now to get the best youth soccer gear from trusted names like Kwik Goal, Nike, adidas and more. The youth soccer equipment in our online store is designed to give young players the best soccer experience they can get, both during practice and at game time. You can find everything from shin guards to backpacks and more in our huge selection of kids soccer equipment. We’ve also got kids soccer gear like captain arm bands, ball pumps and bags for the field equipment your child needs for practice. Practice and games will run smoothly thanks to all of the youth soccer gear we carry at soccerloco. When you’re looking for quality equipment at a great price, soccerloco is the place for you. soccerloco is the best place to shop for your kids’ soccer gear because of our dedication to bringing you the lowest prices and the best services we can offer. If our great variety of youth soccer equipment and low prices aren’t enough to get you hooked, the affordable flat-rate shipping we offer on all orders shipping in the continental United States will keep you coming back to soccerloco for everything you need for your game. If you’re unhappy with your order of kids soccer equipment for any reason, you can return it with no added hassle. So shop with soccerloco today to get the youth soccer gear your child needs from the leader in soccer retail on the web.